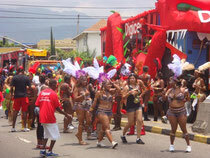 Carnival paraded Hope road tp event square today. Soca,soca nothing but soca in a few hour. Road was block at many place. I went to Cross road to show short cut to my friend but long way than usual.